Realtime Gaming infuses an Eastern theme in the God of Wealth video slot game, creating a world filled with colorful Chinese symbols, Oriental sounds, and the promise of good fortune. Trying your luck at claiming prosperity is simple with this 5-reel video slot offering 25 paylines. A mysteriously intriguing backdrop sets the stage for an experience scattered with Oriental icons and the promise of bonus rounds, big wins, and free spins. This progressive slot game offers a rich prize that goes up to 10,000 times your bet if you happen to capture it. Claiming it is made even more possible with the special features designed to increase your odds. RTG has gone into the Orient to capture real-to-life details for each of its symbols, helping them craft a truly entertaining slot game. Notable icons include the God of Wealth, Chinese lanterns, golden ingots, tigers, dragon heads, oxen, dragons, and the number 8. 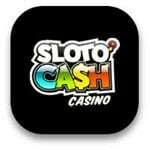 The God of Wealth video slot game has all the bells and whistles of popular casino titles. 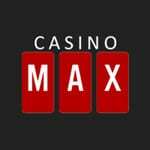 It offers two bonus features, wild icons, free spins, scatters, and the special trigger for features. With all of these options available, it should not take too long before you win in this casino slot game. The scatter icons appear as golden ingots. If you spin three of the ingots on your reels, you trigger the free game feature. If more golden ingots appear during your scatter round, you win ten free games, giving you even more chances to win big money on the God of Wealth video slot game. If you see the God of Wealth icons, get a big smile on your face because they perform as wild symbols. If you have a winning payline when the gods appear, you double your prize. It's important to note that the God of Wealth icon cannot replace the golden ingots, a fact that limits how well this wild symbol works for you. To get to the free games, you need to land three God of Wealth icons that take the place of the ox, tiger, and dragon, turning your spin into a trigger for lots of free games. Now, you know why you should start to love this icon. If you need any help in learning the rules of the game, just check out the tab to read up before you start playing. The God of Wealth video slot game delivers awesome sounds that seem to fit right in with the highly detailed symbols found in this game. 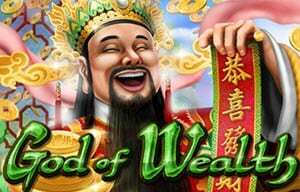 Play at God of Wealth slot Now !